I have several unusual culinary proclivities. When I was a child, I would ask to be excused from the dinner table and scrape my plate behind the floral-patterned couch in the living room, the one against the far wall. 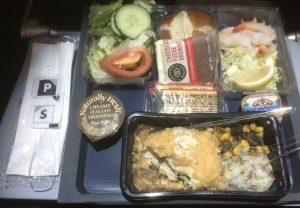 Oddly, although this home-cooked food caused great aversion, I’ve always looked forward to, with childlike wonder, the mass-produced airplane meal. To this day, I celebrate the ritual of unpacking the utensils and eating each tiny, compartmentalized course in quick succession; I savor each bite knowing that adventure is afoot. After dinner, I stare out the window into the black everything as the year methodically lapses back home. I imagined a cacophony of clinks over airplane-sized bottles of champagne, but no one seems to notice, lulled to sleep by the monotonous hum of an apathetic engine. I land in Entebbe, Uganda around 10pm and the new year officially begins in an unknown city on the edge of Lake Victoria in East Africa. During IAP, a classmate and I are teaching communication and problem-solving workshops at a transportation startup in Kampala, but right now I am tired and fall in and out of consciousness on the 2-hour ride into the city. Communication and culture are intimately intertwined and over the following three weeks, Nadia and I learn as quickly and vigorously as we teach, adapting our lesson plans each morning based on the previous day’s activities. It’s a peculiar line that we walk between the multifaceted and deep-rooted Ugandan tradition and our own western curriculum. We seem to fall into a quiet rhythm, however, and our afternoon workshops in Building 3 begin to resemble a harmonic call and response, if only slightly out of tune. I have journeyed with the Globo-Treks and 100+ person club trips, although this excursion includes only Nadia and myself. There’s a level of introspection and depth of conversation that are possible on these more intimate trips that are not easily accommodated elsewhere. Since I was a child, I have loved traveling to faraway places. When I was younger, it was the mystery and awe of the unknown that peaked my curiosity – an element I am reminded of with each bite of my transatlantic cordon bleu. Now, I appreciate that it is as much a desire to demystify myself as it is the world. Licensed mechanical engineer and entrepreneur-in-training, Nick is pursuing an MBA at the MIT Sloan School of Management. Having recently relocated from Denver back home to Boston, he looks forward to vaulting himself firmly into the unfamiliar, both at Sloan and within the larger MIT community.